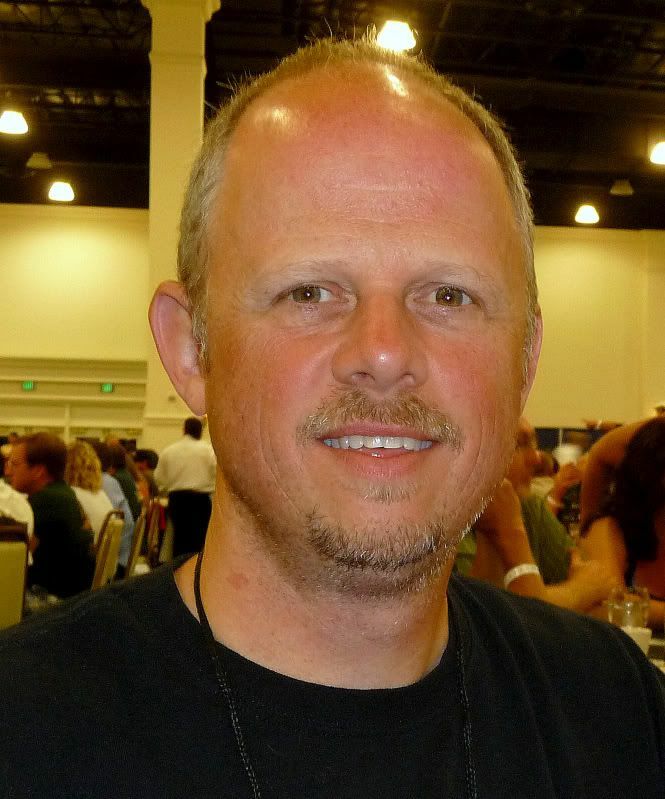 Hey Patriot, I want to see pics of your pazole verde recipe. I had pazole verde the other day at lunch. Oh man was it good. I went back to the shop and curled up in the corner for a nap. Ask and you shall receive! I am going to smoke a whole chicken today and use it in my pozole verde instead of pork shoulder. I'll post pics later. I haven't tried to cure or dry any of the sausage yet but was just talking to my buddy I brew with and we were talking about making some sausage. We think we are gonna make smoked sausage next time if I can devise a decent recipe. Right now I just make Italian Sausage as I have my Wife's grandfather's (who came over on a boat from Sicily) recipe that I like very much. I'm still working on my Boudin, so far I haven't got it dialed in where I want it yet. I too am a better cook than brewer, though I can probably chalk that one up to experience. Been cooking for years, and brewing for only one. I love SE Asia food: Lao, Thai, Indonesian, as well as Mediterranean and Middle Eastern. Greek and Lebanese are favorites. Ok, cap. Here are photos of today's pozole-fest. The pics were taken with my phone, which has pretty decent resolution (3-megapixel camera phone) but the colors are a little off. 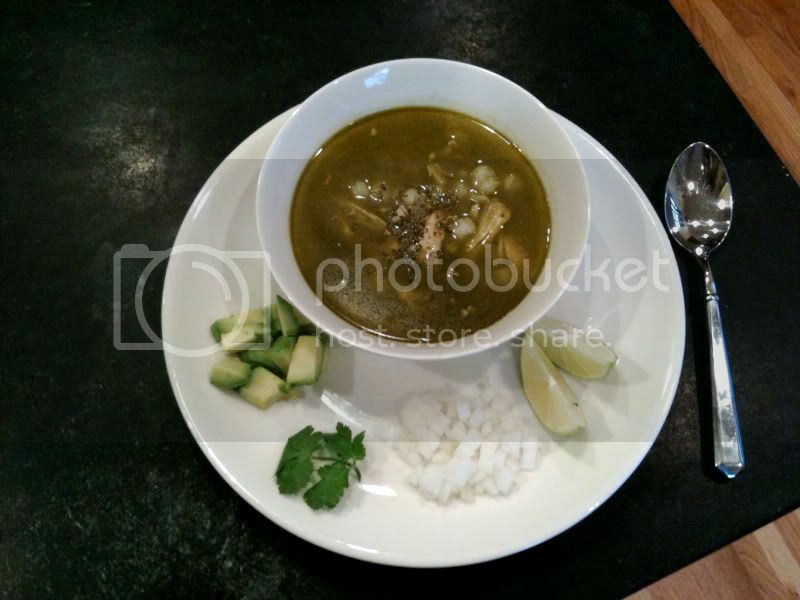 The pozole is much more olive in color than the photo suggests; in the photo it looks sort of brownish. 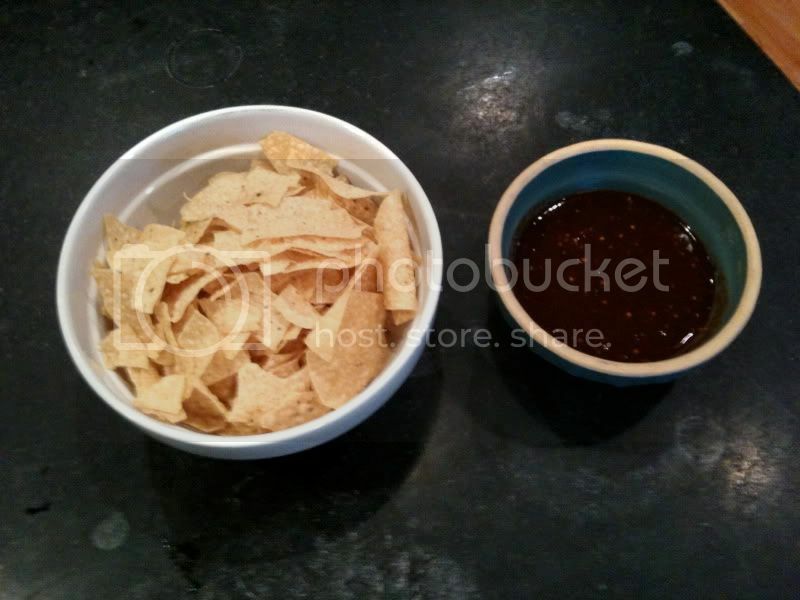 The ancho salsa is brick red in person; it looks really dark in the photo. 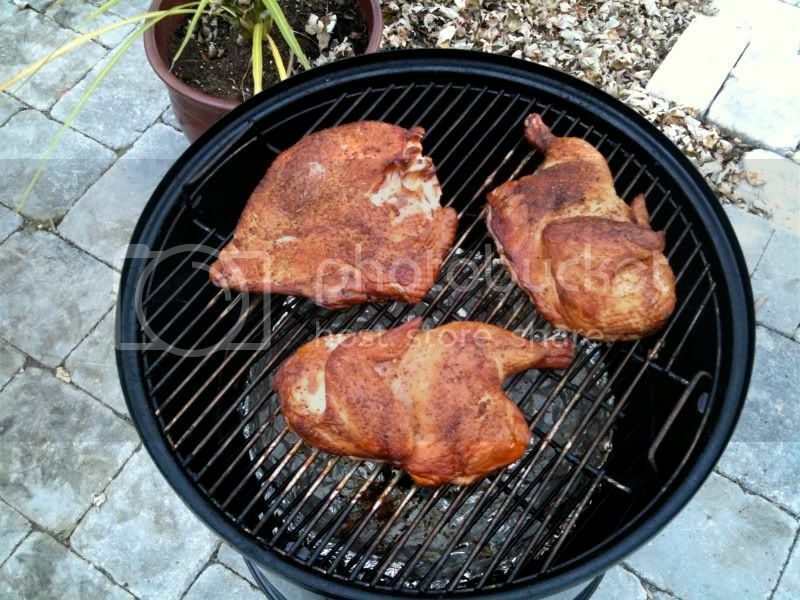 First, I smoked a whole chicken (butterflied) and a turkey breast. I only used one half of the chicken for the pozole. The rest of the meat will go in various dishes throughout the week. Here is the finished pozole with garnishes. I changed the recipe up a little bit this time. Instead of making my own hominy, I just bought two 15.5 oz cans from my local grocer. Also, I used swiss chard instead of sorrel. Finally, I subbed a bay leaf for epazote (not a very close substitute, but it lended a nice flavor anyway). Ancho salsa with roasted tomatillos today. At the end of the meal, I dumped the coals from the smoker into the fire pit. After about 30 minutes, there were some excellent coals for roasting homemade marshmallows. 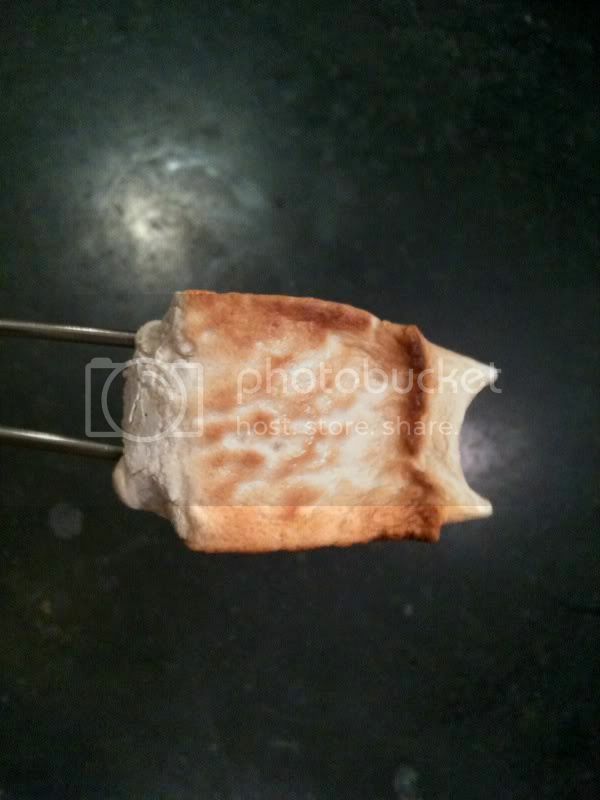 These marshmallows were made with some brown sugar, so they tasted like caramel and maple syrup when they were toasted. Cap! Glad to see you, man. Let's get this thread started! Smurfe, great looking Mexican dishes. I, too, am an authentic Mexican food fanatic (among a lot of other ethnic fare). I also love Indian and Sichuan cuisine. French and Italian are favorite too. Basically, I just love food. I am also a food lover. There's not much I don't like...I believe great food is created from the heart...just like great beer. Capp...glad to see you and your awesome culinary skills over here. Cappo, would goat work with that too? We/I neeed some goat recipes. Awesome idea! We had a dairy goat farm when I was a kid (pardon the pun). Since the buck kids don't produce milk, we usually had a freezer full of goat. Haven't had it in almost 30 years and forget what it was like. I'll have to find a butcher that can get some for me. That Greek food looks amazing. A bottle of retsina and/or ouzo, and some souvlaki and dolmathes...I really need to get ingredients for something similar soon! Here's my attempt at Korean food (minus the kimchi, I am not a huge fan). 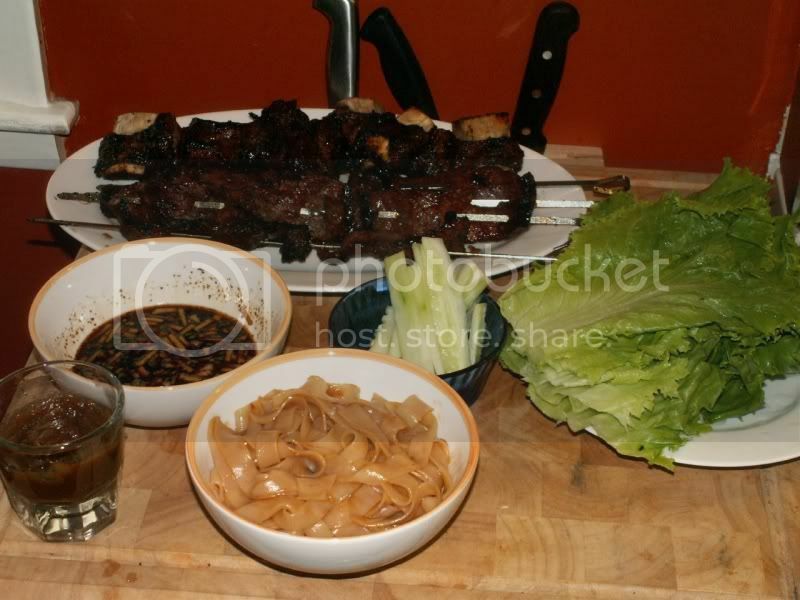 The picture is bad but the meat is butterflied beef short ribs (galbi kui) and bool gogi. Spicy bean paste (chinese, not korean, though) and a soy dipping sauce. Also, this ought to count for ethnic cooking...Norwegian food courtesy Andreas Viestad. 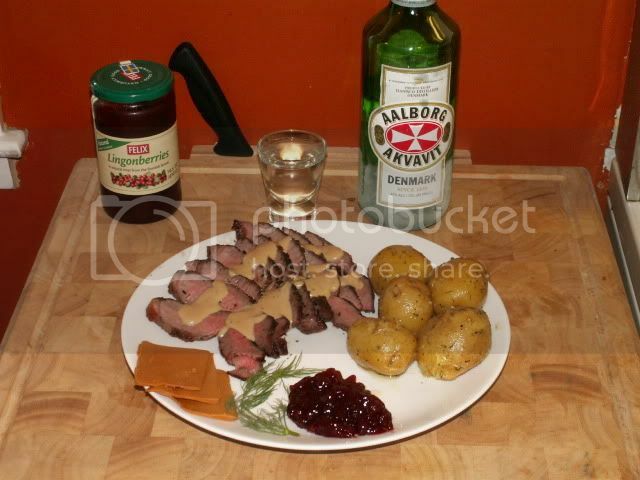 He made the recipe for venison, but it works with beef sirloin. Juniper/fennel spice rub with a brown goat cheese sauce. And of course, akvavit. I'm also a big fan of the pizza making discussion back at the old forum. Keep it up, guys! Indian food while camping. Sounds like a lot of fun. It would be great to set up a campsite tandoori oven. 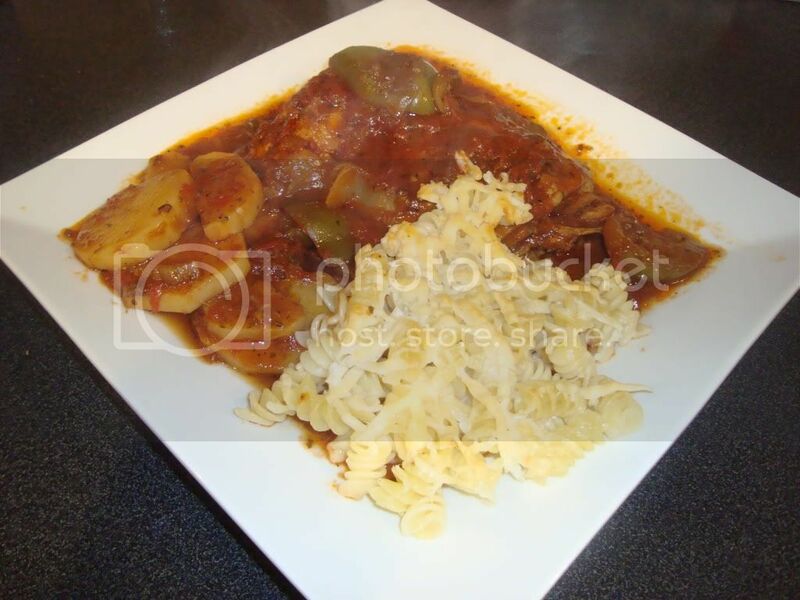 The interesting thing with this variant of Chicken Caccitori is the use of cucumbers in the sauce. Not to many dishes call for cooked cucumbers. Take a sauce pan and get it nice and warm over medium heat. Then put in the oil and chicken legs to saute them a little. Sprinkle some salt over the chicken legs as they cook. Then add a hole onion sliced, a few stalks of celery chopped, a green pepper sliced. a few cloves of garlic whoile but broken open. Add a little more salt and pepper. Then ad some oregano, basil, bay leaf, pinch of cinamon, and pinch of nutmeg. Stir and satue till the onions and veg become a little brown. Then de-glaze with about a1/4 cup of balsamic vinegar and then add about a 1/4 cup of water. Then add a large can of crushed tomatoes. Then add about 1/2 cup of diced cucumber. and about 20 raisins. Let all of this simmer till the chicken is tender. Then slice up two or three potatoes and add them to the sauce. Simmer over low till the potatoes are cooked. Squeeze the juice of one lemon into the sauce and stor a little just before serving making sure not to break the potatoes up. Serve with pasta, rice or nice hearty bread. I could eat Italian food as the year is long. Did you use any wine in the dish? What's your stance on using wine in Italian dishes? That lamb looks great! \looks like something else I may need to try. Would it work well with pork? As far as the other place, like I said in my PM to ya, it's like going to a bar that turns out to be a sausage fest. I'm done with it. Wease, use the spedie recipe I gave you and sub lemon juice for the vinegar and leave out the basil and you basically have it. No wine in this recipe.The vinegar serves as a de-glazing agent and leaves behind a slightly sour flavor. I think that is the flavor desired in catcciatori. The acidic vinegar flavor. Wine leaves behind a sweet flavor. Wine is great in Italian cooking. It doesn't go in everything but they surely use it. French food while similar to Italian cooking uses a lot of wine. Wine is a huge thing in France. In France the most important thing on the table is the wine. In Italy the most important thing is the food. Thats one big difference that I found. Being a huge fan of french food, I've read that France wasn't always such a culinary behemoth (I actually think french food has been somewhat eclipsed by that of Spain in recent years, but that's another topic!). In the 15th century, when Catherine de' Medici of Italy married Henry II of France, she was apparently appalled by french food. As a result, she insisted her italian chef come with her to France so she could eat "proper" food. Supposedly, the italian chef turned his french counterparts on to italian cooking methods and had a massive influence on the country's cuisine. Of course, France came into its own, culinarily speaking, over time and truly has one of the world's great cuisines, IMO.